Successfully Added Underwater Scuba Mask DVR - HD 720p, Wide Angle Lens, 8GB Memory to your Shopping Cart. 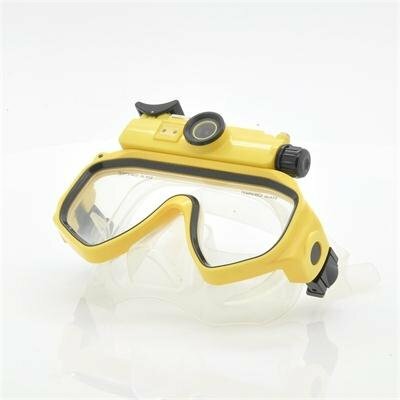 Underwater scuba diving mask featuring a 720p digital video recorder for photos and videos whether you are snorkeling with the family or going scuba diving! This scuba mask with a built in DVR takes high definition 720p videos and pictures at a depth of 20 meters, so you can use this either on a shallow reef or a serious scuba diving voyage. The DVR camera on this scuba mask is also fully detachable just in case you want to simply use the mask for splashing in the pool. Even better, this handy scuba camera comes with a wide angle lens for 100 degrees of viewing, meaning you will catch more of what is going on around you as you swim! Included in the package is a free 8GB SD card for taking hours of video or pictures, and if you need more you can expand that to 32GB for loads of camera action on your underwater adventures! Finally (if the rest wasn't enough) not only is the scuba mask and DVR fully waterproof, but is also built with hard ABS, flexible high quality rubber, and tempered glass for excellent underwater vision and long lasting durability. This scuba mask with DVR and 720p resolution is in stock now and available at a factory direct wholesale price from the leader in action cameras, Chinavasion.